Tsui Kam-pui of Tai Long Wan village hoeing in his taro field. He owned a rotavator, but it seldom left the shed. An old couple worked this Lantau hill farm (the old woman is working in the field in the centre). The beds descended right down the mountainside to the sea -- all done by hoeing. Gardeners dig (except no-dig gardeners), but most small farmers in the Third World use hoes, especially in the East. A Chinese peasant wouldn't have any use for a spade or a fork -- they remake the neat rows of beds in their fields several times a year, with a hoe. They work away at a relaxed, steady pace, and can do a whole field in a day. Once you've mastered a hoe, you won't want to use anything else. This hoe is used by villagers in the high valleys of the Swiss Alps. Light, strong, sharp and well-balanced, such a hoe encourages a steady, tireless rhythm of work. We've had this one for 14 years, and it's as good as new. This hoe has a beautiful, shaped stock, like an elongated axe handle, great to use. It also came from the Swiss mountains, fitted with a huge blade like a big shovel, weighing 5lb, used for digging potato beds. We removed the blade and replaced it with a standard 2lb blade from China, which was fitted for a round stock, not a flat one like this, so it's secured with two shims. This pointed, heart-shaped hoe really bites into hard ground. We cut it to shape from a standard 2-1/2 lb hoe from China. The stock was somewhat warped (half-price! ), which gives the hoe a better angle of attack. Stocks sold in Hong Kong are round, and heavy, so we narrowed it with a spokeshave to give a better grip and lighter weight. A 2lb hoe with the blade cut to 4 to 5 inches and serrated on the inside with a hacksaw makes a fine weeder, both chopping and tearing the weeds and mixing the shreds up with the surface soil to make a mulch. Angle the serrations one way on one half of the edge and the other way on the other, meeting in the middle in a V.
A 2lb hoe with the blade cut to a V-shape with a blunt, rounded point and the stock shortened to about 2ft is great for square foot gardeners -- ideal for loosening the topsoil of a single square foot and mixing in some compost after taking out a crop. Hoe blades are bevelled on the OUTSIDE. Keep them sharp. In humid weather wood absorbs moisture and swells, when the weather's dry the wood dries out and shrinks. So the stock that was tight and solid in the wet season suddenly loosens when it's dry. Stand it in water overnight, and it will tighten again. Better, stand it in linseed oil. Best of all, use biodiesel. If you fit the stock to the tool in the first place using Alexander Weygers's method, it will never come loose, rain or shine. 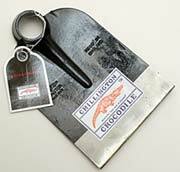 The Chillington Tool Company of England has been supplying quality hot-forged hoes for over one hundred years. Chillington hoes are sold throughout the world under a number of different brand names, the most famous being the "Crocodile". In the US, EasyDigging.com supplies Grub Hoes, Grape Hoes, Azadas, and more made by British supplier The Chillington Tool Company. Chillington Tools distributor in Ireland and the UK, full range of hoes, sickles -- Chillington Hoes, Co. Mayo.